What great timing! 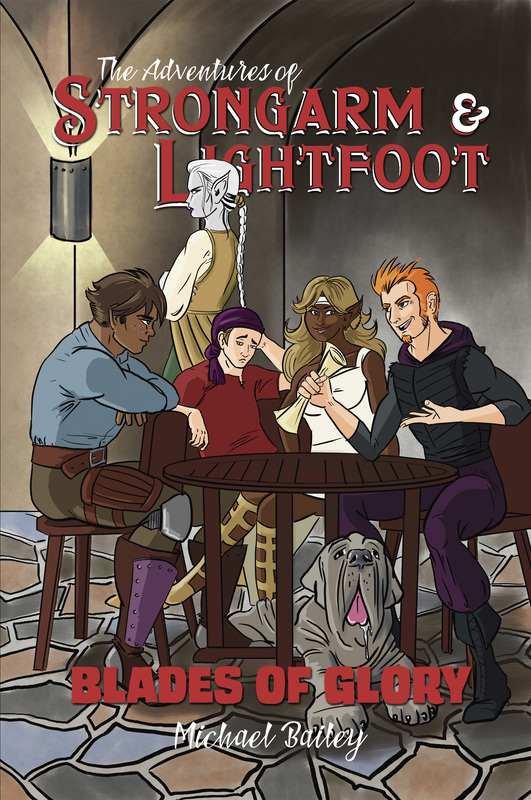 Tomorrow is my day as the invited guest author at the Connecticut Renaissance Faire, and I’ll be able to start talking up in earnest the next book in the Strongarm & Lightfoot series, because the cover art is finished! Tricia Lupien, my ever-awesome cover artist, wrapped up her work yesterday, so now it’s just a matter of my editor Julie finishing up her side of things, and then it all comes back to me for final revisions and formatting. I’m hoping to have everything done so The Adventures of Strongarm & Lightfoot – Blades of Glory is ready to go by mid-October. Good pay for simple recovery job, payment to be rendered upon successful completion of contract. Interested parties please report to the Woeste City Council. Be ready to provide credentials upon request. No Hruks need apply. The council’s story doesn’t quite add up but it’s willing to pay good money for the mask’s return — and all the companions have to do is hike through a cursed forest, search a lost necropolis crawling with unspeakable horrors, and recover the mask from a gang of armed bandits. The greater challenge may lie in first convincing the council not to award the lucrative contract to a rival party, the legendary adventurers known as the Noble Blades — which is easier said than done when a sin from Felix’s past rears its head in an unexpected way. But if Derek, Felix, and their friends wanted easy lives, they’d go herd sheep or something. The Adventures of Strongarm & Lightfoot – Blades of Glory is the third book in the irreverent fantasy series by author Michael Bailey (Action Figures), a tale of bold heroes, dastardly villains, terrifying beasts, magical artifacts, dark pasts, mysterious circumstances, deceptive motives, atmospheric locales, and gratuitous violence. Blades of Glory includes a bonus short story: Companionship, Compassion, Restraint, and Other Things Erika Racewind Dislikes – A Strongarm & Lightfoot Side Quest. If you dig the artwork, head on over to Tricia’s Redbubble shop, because you can get it on a variety of apparel and accessories.